The player is Kyle Hyde - an ex-cop, searching for his old partner Brian Bradley. He arrives at Hotel Dusk, a small hotel located near LA. By exploring the hotel, conversing with the hotel guests and interacting with the environment, Kyle gradually uncovers the mysteries surrounding the hotel and its patrons. 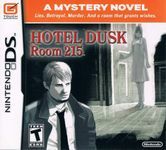 One of the most distinctive features of Hotel Dusk: Room 215 are the character graphics - hand-drawn, black & white sketches of people.